At this point the pit flooded with water up to the 33-foot level and bailing out the water did not lower the level. This excavation was given up and another one was not attempted until 1849. These investors got all the way down to the 86-foot level, where it once more flooded. Excavation attempts in 1861, 1866, 1893, 1909, 1931, 1935, 1936, and 1959 all proved to be unsuccessful in finding anything substantial. In 1967 Baniel Blackenship and David Tobias formed Triton Alliance, Ltd and purchased most of the island. 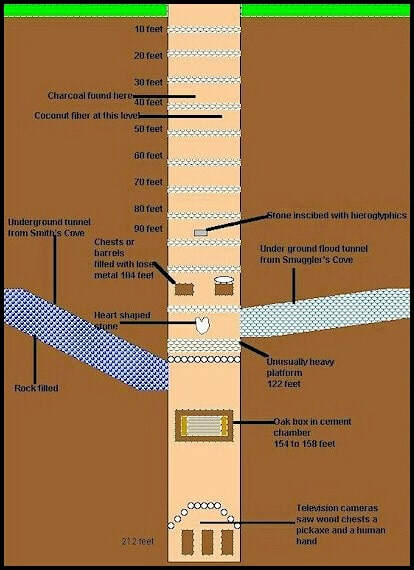 In 1971 the Triton workers excavated a 235 foot shaft supported by a steel caisson to bedrock. Blackenship and Tobias then lowered cameras down the shaft and recorded a presence of some chests, human remains, and wooden cribbing tools. It is even said that there was a severed human hand skeleton on one of the chests, but they were not able to get to any of these remains. Even Thomas Jefferson and Franklin Roosevelt, American Muggle Presidents, both had running documents about hunting for this treasure over the decades. There are a few pirates with whom people suspect to be behind this treasure. The most popular is that Captain Kidd, known for burying his treasure, put it there. It is speculated that maybe even Blackbeard put it there as he claimed to bury his treasure “where none but Satan and myself can find it.” Others think that maybe Captain Kidd and Henry Every used Oak Island as a community bank for all of their pirates, but whatever the case - neither muggle nor wizard has been able to uncover this mystery yet. Another, and probably the most popular of all pirating legends, are the Treasure Islands. Along the Gulf of Mexico resides Padre Island that is around 130 miles long. 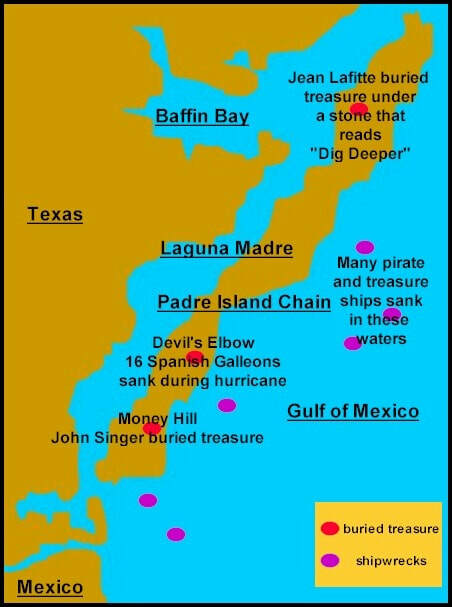 There were many hurricanes that hit this area causing multiple Spanish Galleon ships to sank and all of their gold and silver went with it. In addition to these coins, it is rumored that Jean Lafitte buried treasure here under a stone that read “Dig Deeper” and John Singer had a lot of buried treasure here that he called Money Hill. John Singer arguably has the most famous story that begins with him setting sail in 1847 alongside his wife, four sons, and their hired hand. Not long after leaving Port Isabel they encountered a storm that sent them crashing into the deserted island of Padre. The Singer family had no idea that there might be fortune buried under this island, but they nevertheless fell in love with the island and decided to make it their home. When a rescue vessel finally came, they refused to leave and instead started to build their own life in the tropical island. One day some of the children came across some Spanish coins while they were exploring, and shortly thereafter the Singer family found more coins, and eventually a wooden chest containing about $80,000 in jewelry and coins. The family continued to find pirate’s treasure along the island, of which Singer kept the bulk of it in a large sand dune which he named “Money Hill.” He only pulled money from here as he needed it and all was going very well for the Singer family when the Civil War started. When Yankee gunboats appeared off the coast of Padre Island, John moved his family back to the mainland where they stayed for four years until the war was over. When they returned, they found their house torn down by union sailor for firewood and the island had been hit by a hurricane that changed the entire landscape of the island so that his “Money Hill” was no where to be found, and his old landmarks were destroyed. John Singer never found his treasure and since his passing in 1877 no one else has been able to find it either. No matter your reasons for joining the class, with the conclusion of this lesson, you will be a well informed pirate more than ready to take on the world of piracy and treasure hunting by force. Remember to keep in mind everything that you have learned, but never be afraid of a few risks - you’ll never know what you would uncover if you don’t try! Good luck as you finish up this pirating course and may the favor of the winds be ever on your side!